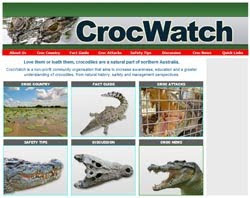 We've just set up the website for CrocWatch, which is a community-based crocodile education and awareness initiative. It's all non-profit, linked to FrogWatch (hence the name), and still a work in progress as we put any available time into expanding it. The goal with CrocWatch is to get better information about crocodiles to the community in northern Australia, both in terms of understanding crocodiles better and also in terms of safety issues. While it has an Australian focus, the issues it presents are global in nature: how to engage communities with crocodiles, increase knowledge about crocodiles, increase respect for crocodiles, and increase safety and awareness of crocodiles in a realistic manner. So come and visit the website at http://www.crocwatch.org and see what you think. Feel free to register and participate in the forums too. Wow, great site Adam! Lots of helpful information and advice for those people who live and visit croc country. Let's hope the NT, QLD governments and NT NEWS, Cairns Post publications set up a link/links to your new site. It would be a great source of information on crocodile safety in Australia. Great work. thanks dlal, we're working on setting up links and getting a bit more collaboration going. We're planning on an "official" media release shortly so hopefully it'll start rolling soon.